The intelligent lighting management system. Providing fine-grained remote control of facility resources. Consolidates multiple existing lighting systems into an easily-managed setup. Pay-to-Play lighting functionality. An integrated booking system that allows clients to book and pay, as well as manage their accounts via a fully responsive interface. Superior analysis to boost your ROI. Completely accurate time-of-use data that can be used for internal analysis or for provision to funding bodies. Conduct comparative usage analysis or generate staff reports instantly, using elegant, readily accessible graphs that are easy to customise. A timed lighting system to reduce ‘leakage’ of venue resources and therefore boost revenue: power consumption is reduced by limiting lighting levels after set times; astro clock technology synchronises lights at sunset. This, of course, can be accessed and controlled from any device. Where advanced web technologies meet premium hardware. Designed from the ground-up for seamless integration with premium lighting products. Highly specific, customisable control for individual or groupings of lights. This includes dynamic settings via fine-grained controls. Accurate time-of-use metrics, elegantly-presented, allowing for timely, relevant reporting. Such data can be used for internal analysis or for provision to funding bodies. Light, reliable, secure, and super fast. But most importantly, it's low-maintenance. Convenient off-site management allows for access from any device, at any time. Additionally, Sporte provides timely and meticulous remote support when you need it. A fully-responsive interface allows users hassle-free booking of facilities and account management. Maximise the possibilities of your lighting functionality with the Sporte Interface. Discover increased lighting control, remote management, accurate reporting and superior analysis. How easy to use is the Sporte Interface? Press play and find out! Do you have any unanswered questions? Send us a message via ​the form below. Put simply, Sporte is the most dynamic and easy to use resource management system available. It will enable you to minimise costs and your customers will love you for it. Can I customise my interface? Absolutely—the interface can be customised to adhere to your organisation's exact requirements. 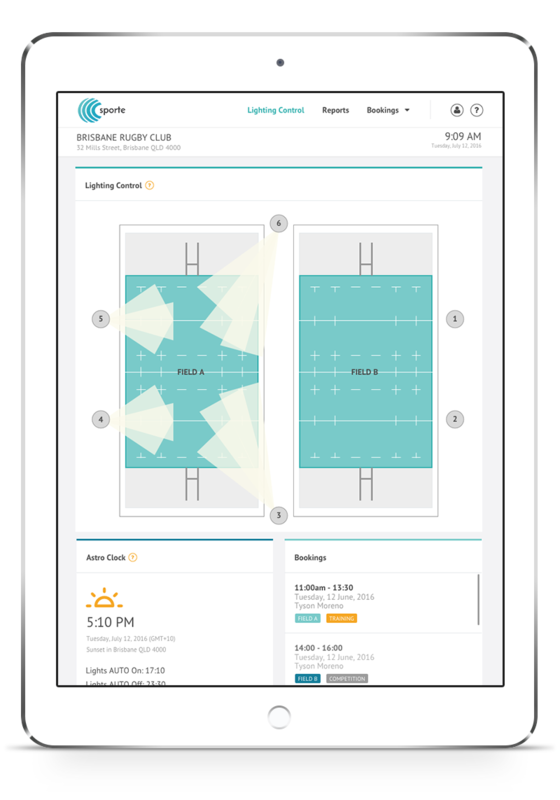 Sporte is the intelligent lighting management system. It maximises the possibilities of your lighting functionality. Discover increased lighting control, remote management, accurate reporting and superior analysis. How do I get Sporte? Easy. Contact us via the email form below. Sporte provides timely and meticulous remote support. Is it only for sports fields? The practical applications extend beyond sports fields. Any venue or space that requires lighting and/or bookings can greatly benefit from Sporte. Interested in Sporte or want more information? Register your interest here. Or visit our blog for updates.